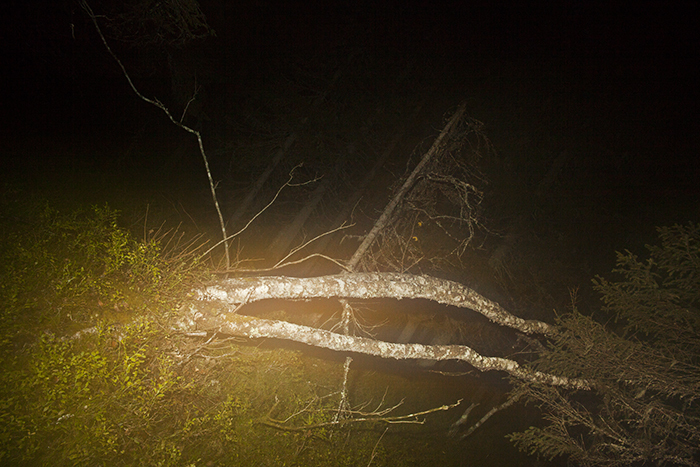 In October 2013, I spent an artist-in-residency in Mustarinda, Finland. This series was very much inspired by the untouched local nature, the Kalevara mythology, Muumi as well as the Finnish people I met. My stay of a month in this forest and amongst a small society overwhelmed me with new experiences, discoveries, like a huge anthill, mushrooms, animals and stones from the ice ages, the pleasures of the people. History, the present and eternity connected. The moments, the light, the heat, energy, power and coldness, micro and macro. These works reflect this, from and into the Finnish world and beyond. I met with a 'hunter', just a few days before I left Mustarinda, someone who knows and trusts nature. "We walked the forest and his pragmatism taught me not be afraid. 'Nature can't do anything wrong'. Hoping this too, one day I could really realize that for myself. Connections between the genes of local geology, flora and fauna." Hiko Uemura lives and works Rotterdam, Netherlands, originally from Japan. To view more of Hiko's work, please visit her website. You can purchase a photograph by Hiko Uemura from the Fraction Editions.